The United States Congress designated the Selawik Wilderness (map) in 1980 and it now has a total of 240,000 acres. All of this wilderness is located in Alaska and is managed by the Fish and Wildlife Service. 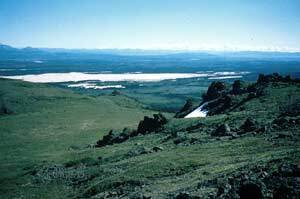 The Selawik Wilderness is bordered by the Kobuk Valley Wilderness to the north. Situated within the Selawik National Wildlife Refuge, Selwick Wilderness is located on the Arctic Circle to the east of Kotzebue Sound, right in the heart of northwest Alaska. Refuge lands extend eastward to the headwaters of the Selawik River and the continental divide, and west as far as the Kobuk River delta. The Selawik Wilderness is found in the Waring Mountains, including vegetated sand dune fields that have persisted since the Pleistocene Era. In contrast to the low, broad Selawik Valley, the Waring Mountains rise gradually from rolling foothills of alpine tundra to a bare spine of low ridges that arc across the northern boundary of the Wilderness. Elevations here rise from sea level to about 1,400 feet. The grinding action of ancient glaciers created the sand, which was carried by wind and water to produce the scattered sand dunes still visible on the landscape. These dunes are the remnant of a much larger system, which at one time stretched as far as the Great Kobuk Sand Dunes in the Kobuk Valley National Park, 24 miles to the north. These mountains and dunes provide some of the best summer hiking terrain on or near the Wilderness, and spectacular summer and winter scenery. In fall, the vivid changing colors of the birch and low shrubs contrast with the dark green spruce forests to enhance the beauty of the area. Lying entirely within the boundaries of the refuge, the Selawik River and surrounding terrain showcase a transition between the boreal forests of interior Alaska and the arctic tundra to the north and west. Selawik's most prominent feature is the extensive system of tundra wetlands lying between the Waring Mountains and the Selawik Hills, nesting ground for hundreds of thousands of waterfowl, including birds from several continents. The myriad lakes, ponds, river channels and sloughs are prime habitat for abundant whitefish, sheefish, northern pike and burbot. In the spring and fall, hundreds of thousands of caribou from the Western Arctic Herd pass through the refuge during their annual migrations. Common plant species here include salmonberries, bog blueberries, bearberries, lingoberries, dwarf fireweed, common fireweed, and bog star. Although camping is generally unrestricted, several Alaska Native communities lie within the refuge boundaries. The residents of the region continue to follow their subsistence traditions, hunting, fishing and camping all across the region. Care is needed to ensure visitors do not trespass on the privately owned Native Corporation and Native Allotment lands inside the refuge boundary. Only a very small percentage of Alaska is accessible by road, and Selawik Wilderness Area, is one of the most remote in the state. The Selawik Wilderness Area has no defined trails or public facilities. Access is difficult due to the area’s remoteness and rough topography. The Wilderness receives 11.1 inches of precipitation, annually. The warmest temperatures come in July and average between 50 F and 60 F. The coldest temperatures come in January and average between -10 F and 4 F.
Planning to Visit the Selawik Wilderness? How to follow the seven standard Leave No Trace principles differs in different parts of the country (desert vs. Rocky Mountains). Click on any of the principles listed below to learn more about how they apply in the Selawik Wilderness.